Akihiko Shiota’s fourth film was one of his most acclaimed internationally, screening in Venice, and earning awards in various international film festivals, for both him and his protagonist, Aoi Miyazaki, who was then doing her first steps in the film industry, much like Yu Aoi, who also stars in this unusual coming-of-age film. “The story revolves around Sachiko, a junior high student who has a plethora of problems. Her father has abandoned her, and her mother has developed suicidal tendencies, extreme mood swings and a peculiar taste in boyfriends. Furthermore, her beloved sixth grade teacher has been forced to retire due to rumors of having an affair with her. 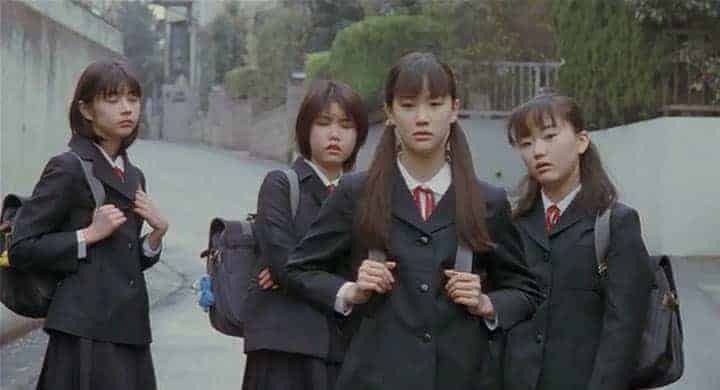 As the pressure from every sides piles up, the girl becomes detached from both school (and her best friend Natsuko) and her home environment, ending up skipping classes and roaming the streets with a teenage delinquent and Mr. Kyuzo, a vagrant with the mind of a child. Eventually, she returns to school, but solace seem to be nowhere for her. Shiota presents the story of a young girl who does not seem able to get a break, thus becoming an utterly tragic figure, with the fact being stressed in the most shocking way in the last part of the film and particularly the finale, who justifies the term tragic irony to the fullest. This aspect is stressed even more by Sachiko’s attitude, as she appears strong and serene, rarely uttering a single word, although it becomes quite apparent to the viewer, that, in fact, she is a very sensitive person, who uses this tactic to cope with her problems and to hold her issues hidden inside her. Despite her efforts though, the events of her life lead to the distance between her attitude and her feelings becoming more significant, to the point that an eruption, and subsequently a succumb to despair become inevitable, again as highlighted in the finale. Through Sachiko, Shiota makes a rather pointy remark regarding bad parenting and the lack of direction Japanese youths experience, as we watch Sachiko’s parents either being absent (father) or making things even worse with their life choices (mother). A small part of the film functions as a high school romance, providing a much needed relief from all the drama, although this part lasts for a very brief time, and the general pessimism that permeates the film soon takes over. Aoi Miyazaki gives a great performance as Sachiko, in an exercise in restraint, with her highlighting the aforementioned difference between feelings and conduct in the best fashion. This sense of measure makes the two scenes where she lets her feelings show even more impactful, despite their brief duration. Yu Aoi as Natsuko has a smaller part, but functions quite well as the exact opposite of Sachiko, with her highlight being in the school drama part. Yoshio Sugano’s editing implements the usual, slow pace of the Japanese indie drama, which fits Sachiko psychosynthesis and the general aesthetics of the film to the fullest. Shiota and his cinematographer, Tokusho Kikumura focused much on Miyazaki, as the films functions as a character’s portrait, both visually and in terms of narrative. Evidently, they both draw draws largely from her impeccable looks but their approach has a specific purpose, to present beauty as a burden, largely due to the conduct of men toward it. “Harmful Insect” is a splendid sample of the Japanese indie, and a film that thrives on context as much as on style.